Despite new payment technologies, the rise of digital banking and the closure of bank branches, cheques are still popular. While we are getting excited about opening accounts with our faces, logging in with our thumbs, and paying for things with sweat or sun beams, it’s worth remembering that – for many customers – traditional methods of transferring money still rule. 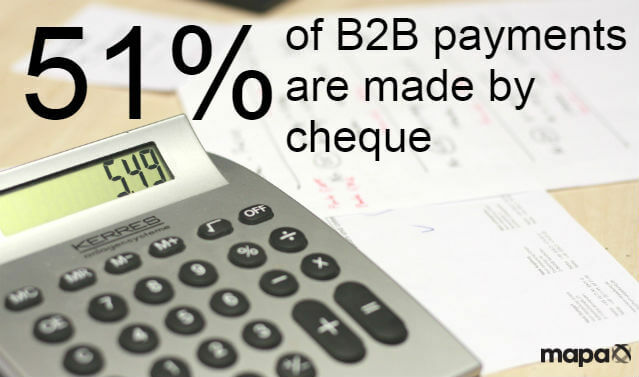 Recent research by AFP, underwritten by JPMorgan, found that 51% of B2B payments are made by cheque, and usage had actually increased among businesses in the US. While it has only risen by one percentage point (since 2013), this is a new trend – cheque payments have been steadily decreasing over the last 12 years. Faster Payments, already a success in the UK, will come to the US next year – but may not reduce people’s reliance on cheques as a form of payment. Around 70% of those polled in the AFP Survey claimed that it is ‘somewhat or very likely’ that their organisations will move most of their payments to electronic in the next three years. However, in UK studies, two-thirds of businesses said that they would encounter problems if they were not provided with the facility to write cheques, which have been around since 1659. 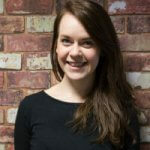 57% of UK businesses said that they had received payments by cheque in the past month. All banks in the UK will need to process cheques as images by October 2017, thanks to The Small Business, Enterprise and Employment Bill passed on 26 March 2015. Customers can still choose to pay in cheques at a branch, but banks will likely also offer the option of paying in an image of the cheque via a secure site/banking app. As well as being a slicker process (for customers), the new image-based processing method will mean that cheques clear faster, as the payment is processed instantly. It’s not just businesses. Nearly a third of people in the UK are still using cheques as a payment method, despite the rise in adoption of contactless technologies – although it’s dropped from the 40% level it was at last year. Mintel research also found that cash is still the most common form of payment, with 97% of those surveyed saying they had used it in the previous three months. 558 million cheques were used for payments and to acquire cash across the UK in 2015, and they cleared 404 million cheque payments in Great Britain, with a total value of £455 billion. The average value of a cheque in 2015 was £1,125, an increase from £1,074 in 2014. The peak day for cheques in 2015 was Wednesday 8th April when 2.5 million of them were cleared. 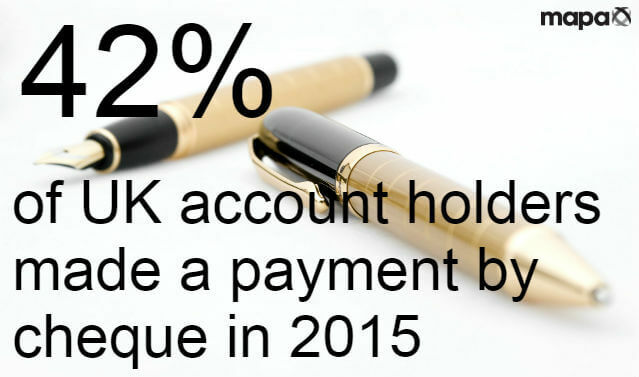 42% of UK account holders made a payment by cheque in 2015. 89,000 euro cheques were cleared with a total value of €1.6bn. The average daily value was €6.6 million, with an average value of €18,622 per item. 17,000 US Dollar cheques were cleared with a total value of $418.6 million. For more insights and competitor analysis around the payments landscape, check out our Payments & Mobile Wallets report.